Slipcases protect your stamp album from dust. When was the last time you dusted your bookshelf and its books? Let’s face it, a bookshelf is a magnet for dust and all that gunk can find its way into your stamp album pages if you’re not careful. Not to mention the damage that dust can do to your stamps! A slipcase, however, can easily be wiped clean with a damp cloth. If you store your stamp album on a desk or tabletop, slipcovers can keep your album safe from spills and messes. Slipcases protect your stamp album from falling over. It is really hard to keep binders upright. It’s in their nature to flop over and splay their pages all over the place. 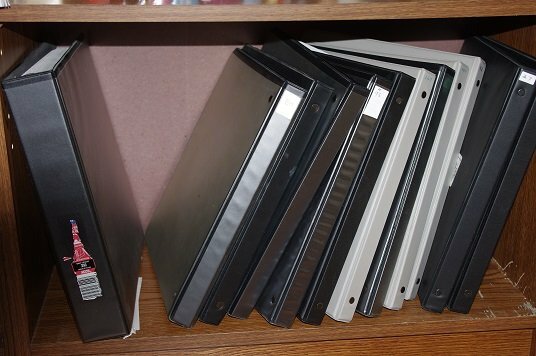 If you use slipcases, no more damaged spines or damaged corners on your binders. Also, your stamp album pages will stay tightly together, which will keep your stamps safe and prevent them from falling out. Slipcases prevent your actual stamp album binders from getting overly scratched and scuffed from rubbing against other books or volumes, or from frequent handling. Finally, slipcases keep your bookshelf looking neat and tidy. In the end, consider how much time and money you’ve put into your stamp collection. Many collectors feel it’s worth the extra expense to go that one last step to make sure their collection is protected from the elements. Arpin Philately has a few slipcases for sale. The Unity slipcase measures 30 x 26 x 7.5 cm. Even if you don’t own a Unity album, measure your binders and perhaps they will fit. If your binders are thinner than the Unity brand, you might even be able to get 2 of your binders in one slipcase. In my humble opinion, the most important use for slip covers, it keeps light from leaving a petina on stamps and pages leaving them a browning tingeThis can be cleaned up with hot water and dish soap..